A Holiday Season Suite for your desktop. 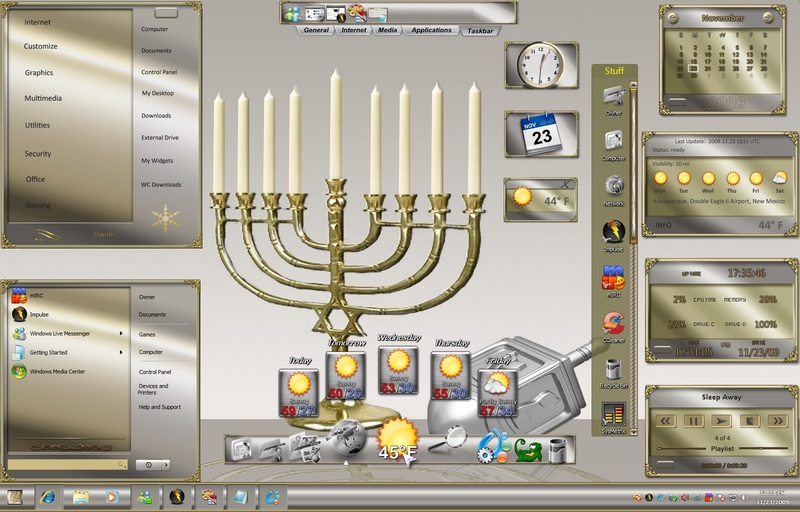 The core for this Suite is the Hanukkah and Friends WindowBlinds Theme by k10w3. As a Master Apprentice skinner k10w3 shows her talent and skills in another fine WB Theme. I'm sure you folks remember Steampunk, well this is another you will want to have. Please take notice when you visit her WC Home Page, as I know you will, that she has put her touch on not only WBs but just about anything else out there that you can skin. I think she is up to the challenge gentlemen. Can't wait for the next Skinning contest. K10w3 has made this Theme for XP, Vista and Win 7, there are three substyles, Hanukkah, Solstice and FSM and three wallpapers, so that's lets see, the number of OSs x the number of substyles x the number of wallpapers, ah that's alot of different looks for the desktop. RedneckDude has been busy again adding his fine DX skins and the IconPackager Reverse IP by DigitalCHET also compliments the Theme very well. Just a note about element placement on the desktop, I try and put them in the screenshot so you get a chance to see what is available. Where they wind up on your desktop is up to you. I hope you enjoy this Suite and as always have a great day and a very happy and safe Holiday Season. Thanks, Philly! This one made the old doc happy!